Tailgating has become such a big thing when it comes to sporting events these days. It doesn’t matter if it is college football, or pro football. The amount of people tailgating in the parking lots around stadiums sometimes exceeds the number of people attending the game. It is a social gathering among family, friends and strangers. The lengths that people go to are insane at times. RV’s, and converted old school buses become party mobiles. Everything has been thought of to bring the comforts of home to the parking lot. Food, and drink are taken to the extremes. And everyone knows that when there is a lot of drinking there is a lot of going to the toilet. It fascinates me at times at what people will do when it comes to using the restroom in a public place. When someone needs to go real bad, and can’t hold it they will almost go anywhere. Many of these parking lots have Port-O-Lets set up for the tailgaters to use. Judging from the lines of people that stand in them it is never enough. BioRelief.com sells a variety of portable toilets just for events like these. I had a customer tell me an interesting story of how he was using one of our products that I felt needed to be shared. Even though we carry portable toilets that are wearable and concealable, some people can’t imagine using one for that, but for the tailgating toilet there is a simple solution. An item that we carry is a Tailgating Port o Let. When collapsed they are small and compact and easy to store taking up about 2 feet of space. They can be set up in a matter of seconds and take up about a 4 foot square space. It’s center height is 6’ 6” tall. This essentially acts as a portable closet for someone to go into and take care of there personal business, and maintain the privacy they are looking for. 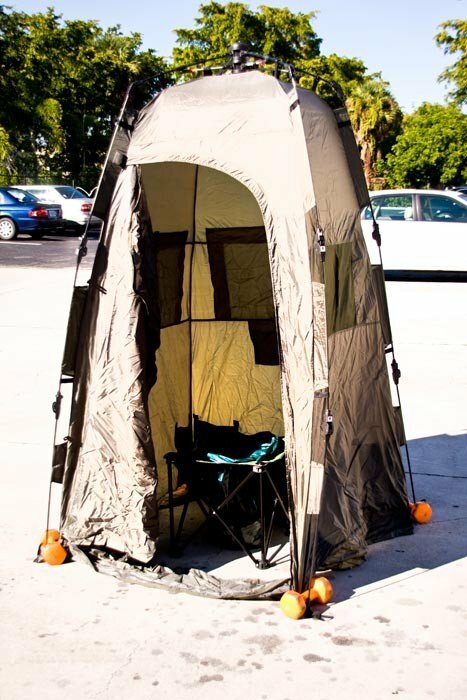 Most people use these privacy tents for camping outdoors, and as a place to shower, or set up their outdoor restroom. Now they can act as your personal Port-O-Let for you, and your fellow tailgaters. No longer will they have to worry about the long lines to wait in to use the bathroom. The only thing left is the portable toilet to put inside it. Portable toilets have come a long way in resent years. We carry portable toilets that easily collapse and make using and cleaning a snap. The first question you might ask yourself is what about odor? For that there are portable restroom kits. They come with toilet paper, hand sanitary wipes, disposable urinals, and waste containment bags. The waste bags, and urinals contain a special absorbent chemical in them that turns human waste into an odorless gel solid in a matter of seconds. The waste bags are dark green so that no one can see the contents inside them, and they have a zip lock feature on the top to close them. Best of all they can be safely disposed of in any waste receptacle. We even carry portable urinary devices for women that allow them to urinate while standing so that they do not even have to sit down. So there you have it. BioRelief.com has the solution for your own personal port-o-let for your family, and friends when you tailgate.